One day, God decided to test Abraham. 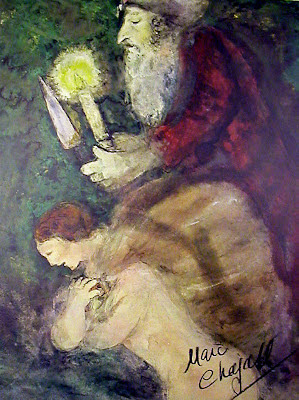 God spoke to him: “Abraham,” and Abraham replied “Yes, here I am.” God then commanded: “Take Isaac, your son, whom you love more than anything in the world, to the land of Moriah, to a place on a mountain that I will lead you, and sacrifice him, kill him with a knife and burn his body, the body of Isaac your own son, as an offering to me.” At this point, the author of Genesis relates not whether this command concerned Abraham, reporting only that the next morning Abraham rose early, cut some wood, loaded up his donkey and took Isaac and two servants out on the road. One wonders what were the subjects of their conversations while sitting by the evening fire sharing a meal before sleep. Was Abraham jovial with his son, his favorite, the boy he dandled on his knee and raised to adulthood, his only son with Sarah his most belovèd wife, or was he more reserved, thinking of what was to come? When asked how her day had begun, the day she was to sacrifice her children, LaShaun Harris related that, when she awoke, she received instructions to give her baby to Jesus, to give up her children as a living sacrifice. She was told to get dressed and to take her children to the pier, a pier she remembered from a trip long before. After three days, they reached a place from where they could see the mountain in the distance, and Abraham told his servants to wait with the donkey while he and Isaac walked on, misleading them to believe that the father and the son were to pray and return. Unlike Abraham, LaShaun did not dissemble, and stopped by her cousin Twanda’s to tell her of her plan to throw her children into the water. Abraham gave Isaac the wood that Abraham was planning to use to burn his son’s body after he killed him, and Isaac carried it up the mountain. There is a similarity here, in the carrying of the wood, to the carrying of the cross by Christ, and there is something sinister here, the father placing such a load upon his son, while the father carries the knife and the fire. The appeals document in the Harris case is a curious read: an attempt to explain the unexplainable. Society wants to label her clearly, to isolate her so that we are to not to be infected by her malady. The legal terminology used throughout is quasi-scientific, and the text breaks down into a Linnaean taxonomy of argument: rebuttals and surrebuttals from experts all in the field of the human psyche, a field that we know deep in our hearts allows for no real expertise, not a science, not even an explanation, but merely a way to classify, to categorize, and by so doing hoping to hold the real issues at bay. Finally they arrive at the mountain. We are told that this is the place that God had told Abraham about originally although, in the story, God has been absent since his original decree. And, in fact, without any further orders beyond those of three days before, Abraham builds an altar, arranges the wood on it, and then binds his son to the altar, on top of the wood with which his body is to be burned. Was Isaac obedient? Did he keep silent? From the testimony of Yashpal Singh: The defendant was chasing the oldest child and taking off his clothes; he was shouting, "No mommy, no mommy." Another child was sitting on a bench and a third child was either in the stroller or on the bench. Defendant caught up with the oldest child, Trayshawn, and brought him back to the bench where she removed all of his clothing. Standing one or two feet from the railing, defendant picked Trayshawn up by one arm and one leg and swung him three or four times before letting him go over the railing into the water. He was shouting "no mommy, no mommy," continuously as defendant was swinging him. Genesis 22:10-12 NIV: Then he reached out his hand and took the knife to slay his son. But the angel of the LORD called out to him from heaven, “Abraham! Abraham!” “Here I am,” he replied. “Do not lay a hand on the boy,” he said. “Do not do anything to him. Now I know that you fear God, because you have not withheld from me your son, your only son.” My Interpreters Bible explains that the angel of the Lord is redactional for God, and thus He does intercede to derail this tragedy. After leaving Twanda's, LaShaun took her children to San Francisco on BART, arriving in the city about 9:00 a.m. They walked from BART to Pier 7. About 3:00 pm she took the children to Pier 39 and bought them hot dogs from a street vendor. They then returned to Pier 7, where they walked around and her children played and watched people fishing.